Eurocom Corporation (www.eurocom.com), a developer of long lifespan, fully upgradable Notebooks, high performance Mobile Workstations and Mobile Servers, is offering a complete line of NVIDIA Quadro GPU powered Mobile Workstations from 15.6” to 18.4” that are specifically designed for Engineers and Designers. Eurocom Mobile Workstations are built to offer unmatched performance, long lifespan and full upgradeability of the processor, memory, storage, operating system and VGA technology, and are designed with the most innovative technology and components available, from workstation class desktop Intel Xeon Processors and RAID 0/1/5/10 support to dual GPU support. Eurocom offers Quad buffered stereo support in quad buffered stereo applications with 3D stereoscopic glasses in all Eurocom Mobile Workstations, 3D displays and NVIDIA Quadro high end solutions. The EUROCOM Neptune also comes complete with a built in emitter. The 120Hz 3D signal is outputted to an external monitor via DVI-DL (DVI Dual Link) port. Eurocom systems and NVIDIA Quadro mobile graphics with Open GL 4.1 are ideal for professional applications such as: Adobe Creative Suite 5.5, Autodesk 3DS Max, Autodesk Autocad 2011, Autodesk Inventor 2012, Avid Media Composer, Dassault Catia, Dassault Solidworks, Siemens X, ANSYS, MATLAB, Dassault Simulia. NVIDIA Quadro professional graphics solutions adhere to higher quality and reliability standards than consumer level graphics cards. NVIDIA Quadro GPUs are designed and built to provide leading performance, reliability, compatibility and stability with applications like Autodesk AutoCAD, 3ds Max, and Dassault Systemes SolidWorks, among many others. Like NVIDIA, Eurocom believes NVIDIA Quadro professional graphics cards are the right choice for these types of applications because they provide the dependability that professionals require. NVIDIA and its ISV partners invest a great deal of engineering hours to provide optimized professional application solutions, resulting in a lower likelihood of a driver related software bug interrupting a professional’s work. Eurocom and NVIDIA recommend that if your livelihood depends on using professional applications, then Quadro professional graphics solutions are the best choice. Eurocom is a leading developer of long lifespan, fully upgradable notebooks, high performance mobile workstations and mobile servers since 1989. The company has produced many firsts and continues to engineer computer systems and VGA solutions that inspire and enable individuals and companies to reach great possibilities. Eurocom has been a leading innovator in the mobile computer industry since 1989, is currently the only developer in the world offering a Mobile Server solution along with a full line of Mobile Workstation supporting RAID 0/1/5/10 with up to 4 hard drives. 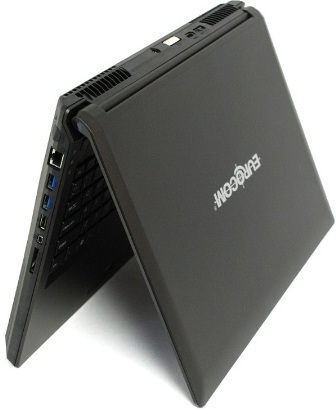 For more information on Eurocom please visit (www.eurocom.com).